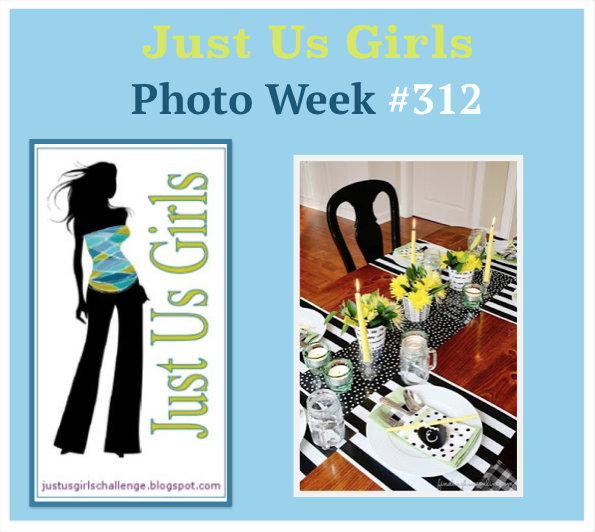 Hello Friends, It’s time for a new Photo Inspiration Challenge over at Just Us Girls. And it’s also time to bid a fond farewell and Thank You to our Guest Designer Melissa Dawn Lane! It’s been a pleasure working with you this month Melissa, and we hope to see you again in our gallery very soon. This card came together rather quickly although now I wish I would have thrown in some green as my fellow teammates have done. Here are a few details: The floral stamp is something I picked up at Michaels. The button center dies are from MFT. The sentiment is from Verve. The twine I just picked up last weekend at Target and it’s thicker then most twine and easier to work with, I think. Please come on over to JUGS and join us…who knows you may become our next Chic of the Week and a future Guest Designer too! I am also linking my card up over at Mojo Monday…where they have this great sketch! I sure hope they don’t mind that I put my ribbon at the top of the sketch, but left my sentiment at the bottom. Hope the weekend is spent just the way you like it! I’m getting together with a couple of friends for lunch so it’s off to a great start! Categories: Cards | Tags: Card making, Cards, my favorite things, rubber stamps, stamping, Verve Stamps | Permalink. AWESOME inspired card — love the dots! I love that polka dot background paired with those flowers! 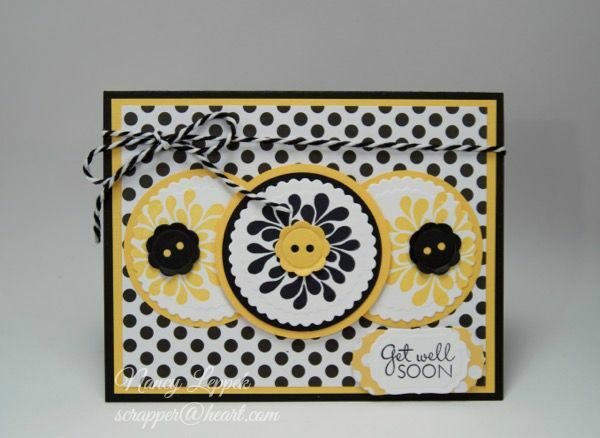 So cheerful and so perfect for a get well card. I really like that you just used the two colors. So bold and stricking. It makes a really happy card that would make any person get well soon. Have fun at your luncheon today. I’m going to an early soccer game and then home to craft this weekend. Hugs! LOVE how you combined the two challenges to make such a PRETTY card! Pretty card and lovely color combo. I like the twine bow at the top. Oooh! Great take on that sketch! Love the polka dot background and those pretty flowers! So pretty and it doesn’t need the green! Love all the dots! Beautiful card with awesome colors. Love the polka dot background too! Great take on both challenges Nancy. Love it. Those polka dots look awesome on the background. Nice touch with the punched buttons. Hope you had a great time with your friends. Super cute card! I love that you picked up on the polka dots and not the stripes! Great job!